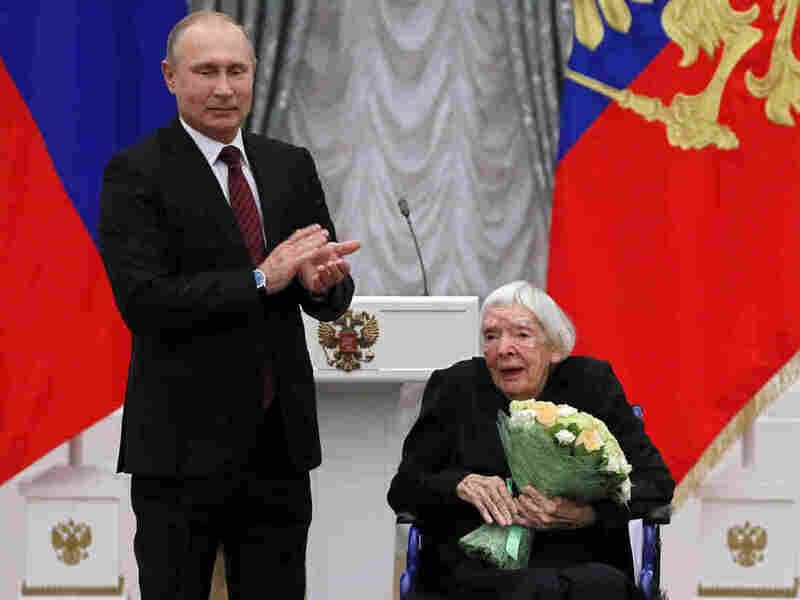 Russians Pay Last Respects To Human Rights Defender Lyudmila Alexeyeva Alexeyeva, who died Saturday, was a longtime Kremlin critic who lived in exile for 16 years during the Soviet era. President Vladimir Putin tried to co-opt her legacy during her lifetime. 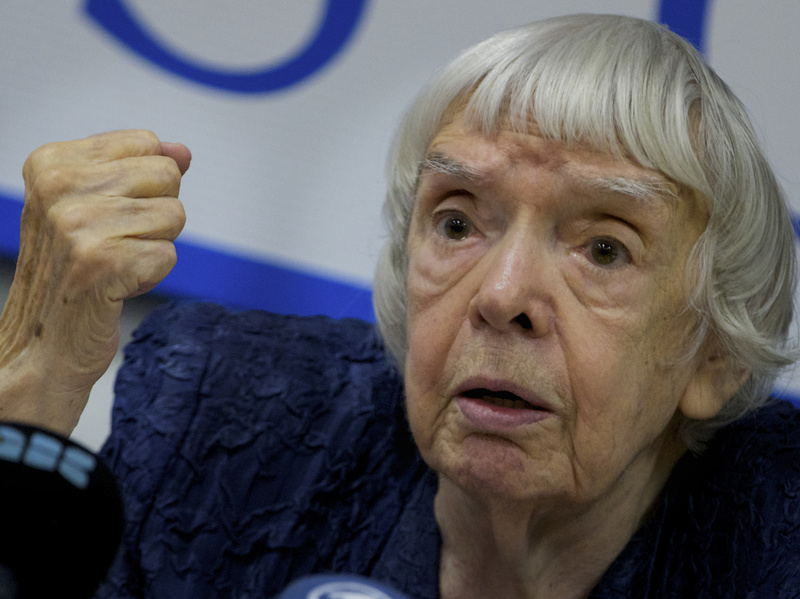 Russian human rights activist Lyudmila Alexeyeva speaks at a news conference in Moscow in 2012. She died Sunday at the age of 91. Russians from all walks of life turned out on a damp and slushy Tuesday morning in Moscow to pay their last respects to Lyudmila Mikhailovna Alexeyeva, a tireless defender of human rights and a contemporary of the Soviet dissidents Andrei Sakharov and Alexander Solzhenitsyn. Alexeyeva, who died Saturday at age 91 in a Moscow hospital, was one of the few public figures who could unify Russians across the political spectrum. Politicians from Russian President Vladimir Putin to his fiercest critic, opposition leader Alexei Navalny, expressed their condolences on the death of the longtime human rights campaigner, who spent 16 years in exile in the United States during the Soviet era. Police officers detain Alexeyeva during a New Year's Eve anti-Kremlin protest in downtown Moscow in 2009. "Thanks to the dignity of such people, our country still has dignity," said Nikita Orlov, 49, a corporate manager waiting to lay flowers at Alexeyeva's open casket in the Central House of Journalists in downtown Moscow. "She gave me and my children — and I hope my grandchildren — the possibility to choose to think independently and not be guided by what is carved in stone," he said. "Thanks to such people, we are alive." "In the last few days, a lot has been said about how important Lyudmila Mikhailovna was for Russia, but in fact she was important for the whole world," said Viktoria Gromova, 35, a human rights activist who traveled from the town of Vladimir, 100 miles east of Moscow, to pay her respects. "Her story isn't just about Russia, but about the U.S., Europe and Central Asia." Alexeyeva's life spanned eras and continents. She was born in Crimea at a time when Soviet dictator Josef Stalin was consolidating power; she came of age during the "thaw" under his successor, Nikita Khrushchev; and she faced the pain of exile during the rule of Leonid Brezhnev. During her time in the United States, she became an American citizen. Russian news agencies report her ashes will be buried in the U.S., alongside her mother, husband and a son. Russian President Vladimir Putin tried to co-opt the legacy of human rights activist Lyudmila Alexeyeva while she was still alive. Here, he congratulates Alexeyeva last December during a ceremony at the Kremlin to present the 2017 State Awards for Outstanding Achievements in Human Rights and and Charity Work. "She was the matriarch of Russia's human rights movement, and to us she's always been 'Grandma Lyuda,' which is how she ironically referred to herself for at least the past two decades," Tanya Lokshina, a senior researcher for Human Rights Watch in Moscow, told NPR. "Possibly she is still with us, because her sharp wit and relentless optimism cannot possibly be taken away from us," Lokshina said. "And that, I guess, is a consolation." Up to her last days, Alexeyeva criticized Russian authorities. But the Kremlin's attempts to co-opt her moral authority led to high-ranking officials and state media celebrating her as a Russian patriot after her death. In a greeting she prepared from her hospital bed for Human Rights Day on Dec. 10, Alexeyeva urged fellow rights activists to act as mediators in "the difficult times" that lie ahead for Russia. "Russian officials today continue to repeat the mistakes of their predecessors, limiting freedoms in the hope of hanging on to power by using dictatorial methods — but in fact worsening their situation and increasing the probability of an uncontrollable collapse of the government," Alexeyeva wrote. At the same time, she said the weakness of Russia's civil society and democratic institutions couldn't be blamed on the government alone, but that everyone — including human rights defenders — shared responsibility for not doing enough to rid Russia of its totalitarian legacy. Alexeyeva tried to do her part. In the 1970s, she produced samizdat, the secretly printed and distributed outlawed texts, by typing up copies of a banned journal, the Chronicle of Current Events. In 1976, after the Soviet Union and Western countries had signed the Helsinki Accords to ease Cold War tensions, Alexeyeva helped found the Moscow Helsinki Group, designed to monitor Soviet adherence to human rights commitments under the agreement. Soon afterward, she was forced into exile. Following Alexeyeva's return to Russia in 1993, she became head of the Moscow Helsinki Group and joined several governmental advisory councils on human rights. She criticized Putin's prosecution of a war against Chechen separatists and used her lines of communication to raise objections directly with the Kremlin. 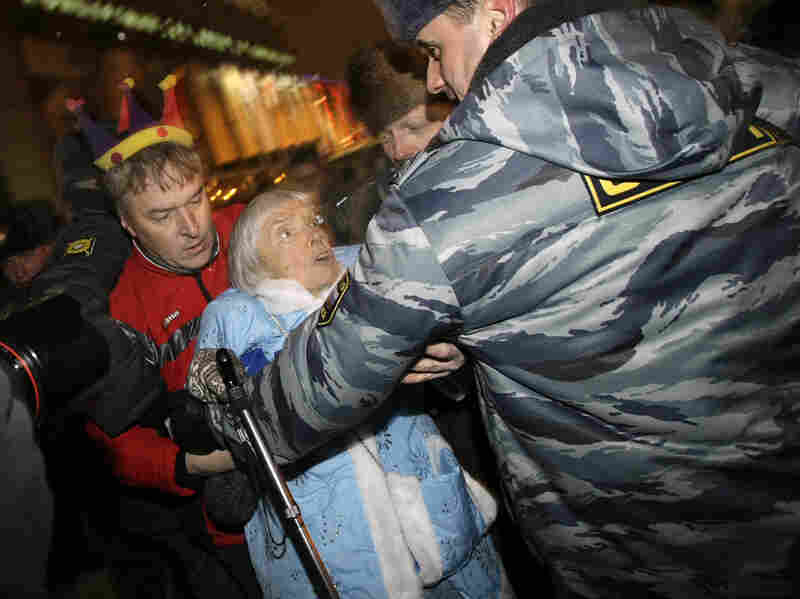 As Putin tightened his grip over Russian civil society, Alexeyeva didn't slow down, attending street protests in Moscow into her 80s. She provided hope and inspiration to younger colleagues dismayed by the government crackdown on civil liberties, says Lokshina of Human Rights Watch. "She'd just shrug and say: 'I saw the Soviet Union fall, and that severe, totalitarian regime lost in the end to a small group of people so much weaker than Russian civil society is today. So, yes, things are bad, but it's not the end of the world — it cannot even be compared to what we faced all those years back,' " Lokshina said. In 2012, Alexeyeva announced that the Moscow Helsinki Group would stop taking contributions from foreign donors to avoid being designated a "foreign agent" by the Kremlin. Putin's embrace of Alexeyeva in her later years was intended to send a signal that "good" human rights defenders didn't accept foreign money, as opposed to "enemy organizations" that did, says Lokshina. Last year, Putin showed up at Alexeyeva's apartment to congratulate her on her 90th birthday. The president arrived with a bottle of champagne and a picture of Yevpatoria, her hometown in Crimea. Lokshina believes the present was intended to solicit Alexeyeva's unwitting endorsement of Russia's 2014 annexation of Crimea. On Tuesday, at Alexeyeva's memorial ceremony, Putin made a point of bringing flowers to her casket. There was a heavy security presence at the building, and policemen cleared the area half an hour before Putin's motorcade came thundering up the street from the Kremlin. "For the government, it's important to demonstrate how they supposedly respect human rights," Mikhail Kasyanov, Putin's first prime minister and now an opposition politician, said as he waited with other mourners. "In fact it's the opposite: Human rights in Russia are being trampled on a daily basis, and that's what Lyudmila Mikhailovna fought against." One person who was prevented from paying his respects to Alexeyeva was her old friend and colleague, human rights defender Lev Ponomaryov, 77. Earlier this month, he was jailed for 16 days for posting a call to an illegal rally on Facebook. His request to attend Alexeyeva's funeral was declined. "Instead of Lev Ponomaryov, Vladimir Putin will bid farewell to Alexeyeva. That's what's called spitting on someone's grave," Russian journalist Viktor Shenderovich wrote on Facebook. Putin didn't stay long. His next appointment was at the unveiling of a statue of dissident writer Solzhenitsyn.